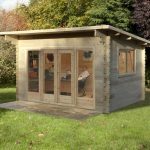 This is a thoroughly modern looking log cabin which would suit a similar style garden, it is effortlessly simple and has stylish good looks. 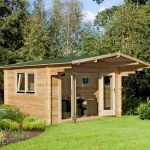 The Danbury is a large log cabin constructed out of long lasting and hard wearing tongue & groove timber. 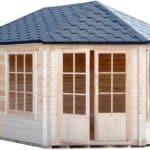 It has a stylish pent roof and opening windows allowing plenty of light and air inside. 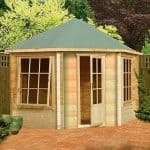 There are double doors allowing ease of transport for all garden equipment and it comes with a 10 year anti rot guarantee. 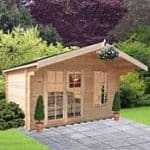 You could choose to use this as a log cabin to while away the hours relaxing, a workshop to cultivate your plants or use for storage purposes. This product is home delivered. 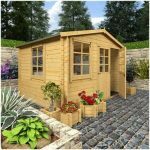 This arrived in a million pieces and 2 days later its almost up, took 2 hours to get it from the front garden kerb side delivery to the rear, and set up , and start reading the awful instructions, its just cheap untreated floorboards machined up to look like a glorified shed! They really should drop the R in there company and replace it with a T.
Hi Richard, thanks for the feedback I am sure your review will help others decide if this is the right product for them.